The tasty, healthy and natural toothbrush for your dog. For years now, the treatment of skin and coat problems has been top priority for veterinarians. The immense increase in the number of dogs with dental problems is striking, however. The primary reason for these problems is the increasing occurrence of plaque, which in turn causes tartar to form; and all the consequences this entails. Because dental problems in dogs appear to be increasingly common, a structured approach in addition to periodic check-ups is vital. You will find this structured approach in the Farm Food Rawhide chew bone. Dogs naturally have a great need to chew on things. They do this because it is the only way for them to naturally keep their teeth clean. In their natural habitat, wolves and other canines will chew on the skin and bones of their kill after a meal. Chewing on soft, tough material cleans their teeth and, in turn, ensures healthy gums. For our domestic dogs the ‘skin and bones of prey’ are best substituted by pure Farm Food chewing products, such as Rawhide® or Antlers®. Rawhide is the dried subcutaneous tissue (the second, strong and tough layer) of the skin of cattle. Our white chew bones are imported from Europe and are made from the hides of free-range cattle that are kept for the local meat production. As the production company is a part of a large slaughterhouse, the hides are therefore mechanically split immediately after slaughter. The outer, indigestible layer is removed for leather production in the process. The inner layers, digestible, subcutaneous connective tissue are washed and cut into pieces to the desired size. After being manually folded in the various shapes, the white chew bones are dried in an oven for several days. One very important aspect of our products is that, because of quick processing, no harmful substances are used during the entire production process. This allows us to guarantee a clean, pure and safe product. Farm Food Rawhide is manufactured in Europe according to HACCP guidelines. Ingredients: 100% Pure dried subcutaneous tissue of beef, no additives. It is a well-known fact that food residue in the mouth is not only the cause of bad breath, but also causes the formation of dental plaque. This plaque is, in turn, responsible for the much-feared tartar and can become quite severe in the long term, damaging the gums as well; this can cause infections and loss of teeth. 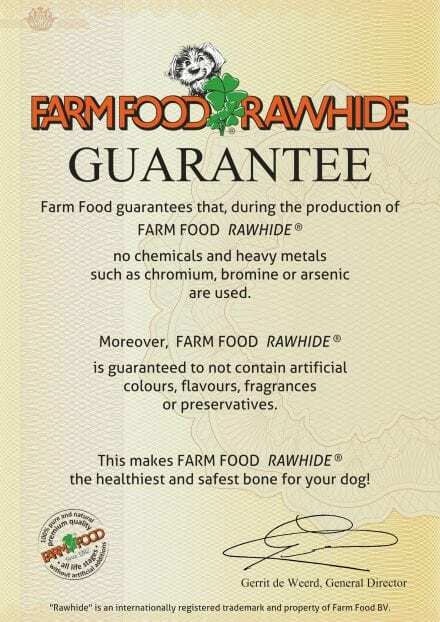 Farm Food Rawhide chew bones are firm, hard and fully digestible. Because of the action of saliva during chewing, a natural collagen protein is released, a protein compound created by the body itself. This collagen has the ability to dissolve plaque. Before this tough material becomes soft enough for small pieces to be bitten off, the sanding action during chewing makes for a thorough and visible cleaning process of the dog’s teeth. 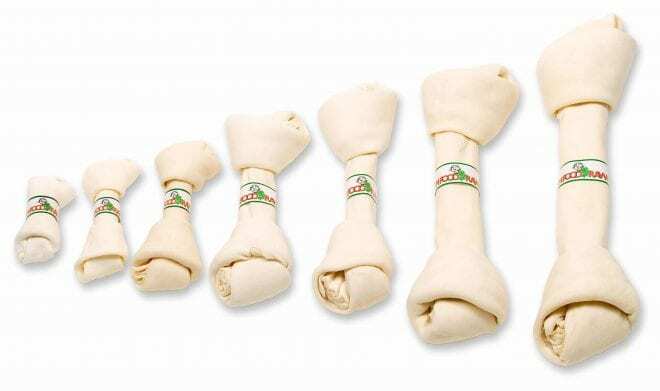 Because your dog has to chew intensively, Farm Food Rawhide helps in preventing and combatting animal obesity. During the chewing process the brain releases endorphins which give a sense of tranquillity, allowing your dog to relax. 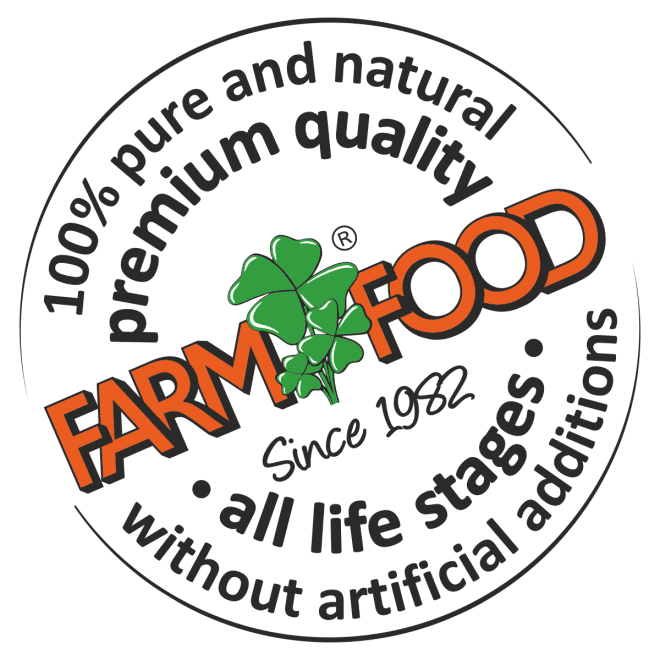 Farm Food Rawhide, 100% real Rawhide®!